Let’s face it; most of us are not going to win the lottery. That means that for the rest of us, we have to resort to saving. Keeping your money under your mattress probably isn’t a good idea. The piggy bank isn’t much better but it is probably fine for small amounts. But if you are trying to save for a big ticket item, or even for the next emergency down the road, it is better to place the money you are saving in an account that will produce more interest. The idea is to try and save at least 10% of your income. With direct deposit and online banking, many of us can actually automatically transfer money from our checking account into our saving account each month and never miss it. You can still take the money out but you don’t have to remember to make the deposit each month and before long, the money in your savings has grown. 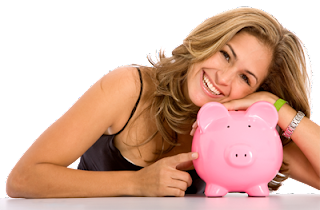 A regular savings account is the basic savings account you find at your local bank. Most banks and credit unions do not charge fees to have a regular account. Frequently the minimum deposit requirement is low but so is your interest rate. But your money is more liquid and you are able to add to and deduct from it in case of emergency much easier than many other savings accounts. This is a type of saving account that you “join”. You do this to save money for a special reason, like the holidays or a vacation. With a Club account you are usually required to make regular deposits. Many banks offer a Christmas Club account. You would agree to deposit a set amount each money- say $50. and by Christmas you will have $600 plus any interest to spend for your Christmas holiday. Make sure that you are aware of the rules and regulations for joining and what the requirements are for withdrawing your money. Also called CD’s, these accounts earn a higher interest rate than a regular savings account but you have to make a much larger minimum deposit. You also have to keep your money in the CD for a certain period of time. The longer you promise to leave your money in the CD, the higher your interest rate will be. Remember that if you withdraw your money before the end of the maturity period, you will pay a penalty. A money market account generally requires a $500- $2,500 minimum deposit and does earn high interest like a CD. These accounts typically limit the amount of times you can take money out each month. Make sure that you are aware of the rules and fees associated with accessing the account more than allowed. These are special accounts and are not available at every lending institution. In a matched savings account, you save a certain amount for a certain period and those saved funds are matched at rates higher than most interest rates. For example, some institutions will give you $3 or $4 for every $1 that you save. An example of a matched savings account is the Individual Development Account (IDA) program. You can typically save $500 and have it matched at $1,500 or $2,000 and use that money for post secondary education or the down payment on a home. Each IDA is different and each has a different set of rules the saver must follow. Getting in the bait of saving is more important than how much you save. If the amount you planned to save is too high, you can change it, but keep saving. I want an email so I can sent you my information of monthly payment of my Gordon's Card. I’d must check with you here. Which isn’t one thing I often do! I take pleasure in reading a publish that will make individuals think. Also, thanks for permitting me to remark!